This print awareness pocket chart activity should be tons of fun! 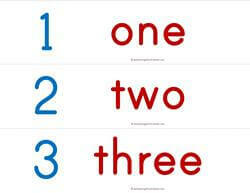 Kids read the number words (1-10), count how many letters are in that word and sort by how many. These words have 3 to 5 letters. This set includes 10 cards with the corresponding numbers, 10 cards without the corresponding number and cards that have “3 letters”, “4 letters”, and “5 letters”. It’s recommended that you print these on cards stock and laminate them. Please check out this page to see all the worksheets, word strips, and pocket chart sorts in this set. Subjects: Print Awareness - How Many Letters?